If you're taking your first steps out into that brave new world of electric razors, with all the various features and price points, it can all be a bit bewildering. The Philips Norelco Click & Style is for newbies, with everything you could need to start, and nothing more confusing than that. An electric razor that comes with three interchangeable heads. One for shaving your face, one for shaving your body, and one for trimming whatever hair is left. Newbies to the electric shaving scene who aren't sure what they're looking for in an electric razor and want a basic sort of Swiss Army Knife solution to get started. The body is mostly a matte back plastic, and sleek for a razor, with red and sliver accents on the front. It's either slick or childish, depending on your design sensibilities. It has one off/on button and a simple LED display which indicates when the razor is charging and fully charged. It comes with three detachable heads that snap onto the top. One is a for shaving your face, and has two circular shavers mounted side-by-side. One is for shaving your body, and has one long bar shaver, with clippers running parallel on both sides. One is a run-of-the-mill clipper, with a plastic guard for adjusting trim-length to one of five settings from about half an inch on down. The Click & Style works in pretty much all shaving scenarios. Dry, wet, with cream/gel, without. The body has two strips of soft touch plastic on the front, and a ribbed grip on the back so it won't slip out of your hands when wet. Those worked fine when I wasn't choking up to grab it by the neck, which wound up being my preferred grip. In all shaving scenarios, with all heads, the shave gets close on the first, or sometimes the second pass. I experienced basically no pulling or tugging, but wound up a bit irritated after each shave, a little "burnt," especially on the neck, even when I'd used shaving cream. But it only lasted for a few minutes. Versatility. Between the three heads you can tend to virtually all the hair on your body, each head can handle the hair it's designed for, though the face shaver can be slightly awkward with its side-by-side heads. And since the whole thing's waterproof, you can do it in the shower or out. The two-headed facial shaver is a bit awkward. You'll want to go for a circular motion, but two heads mounted side-by-side don't make that particularly easy because half the time you'll find yourself strafing, leading with a single head instead of a pair. Most electric shavers have three heads mounted in a triangle so you're always pushing with two, and using the two-headed one like this makes you realize why. Even though all the heads click in securely when you just press them down, it's almost impossible to resist the urge to try and twist them into some sort of locking position. We were able to get about an hour and a half of shaving time from a full charge, and the power retention is good enough that you can last for a while—at least a week—without charging at all. If you're coming from a dead battery, 10 minutes of charge will net you 10 minutes of shave time. Enough to get the job done. The body is shaped really well, and has a satisfying heft without being overly heavy. It's got a textured, trigger-like recess for your index finger that provides a nice grip if you're going at it in the shower. If your body hair is longer than say, a quarter of an inch, you're going to have to mow it down with the trimmer before you can get to totally removing it with the body-groomer attachment to get the best results. If you're into total removal. Don't know squat about electric razors but definitely want to check 'em out? Then yes. The Click & Style shaver is a great place to start. It doesn't have many sophisticated features like auto-cleaning or intensity options, but if you're not all-in on electric razors, you don't need those. In the meantime, it can shave or trim hair just about anywhere on your body, and well. 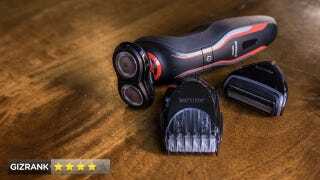 At $70, it's not exactly cheap, but compared something like our $150 Battlemodo winner, but it's a cost-effective way to wade into the world of electric razors and decide if you're into them before you shell out for something more sophisticated.